...space created for our pleasure by suggestions received from Maria Eduarda and met by the Editorial Board. Enjoy and send your favorite models, we are waiting! The EDITORIAL BOARD is grateful for the collaboration and advice of expert on the subject, QUEEN BYA. 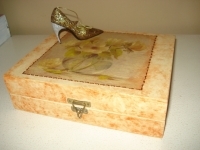 Women shoes has been subject of many articles written in books, magazines and in the internet. They usually declare it as a "Fetish Wear". Claudia Raia (link 1), an importante and beautiful Brazilian actress, was one of that "Fetished Women". Imelda Marcos (link 2), former first Lady of the Phillippines runned a kind of museum, just to show her huge collections of more than 3 thousand pairs of shoes . Other Women like Bia Aidar (link 3), who collects shoes since she was 15 years old, the American actress Billie Madley (link 4), the Brazilian actress Suzana Vieira (more than 300 pairs of shoes) (link 5), the American actress Dita Von Teese (link 6) are few examples of "Fetish Shoe Wear Women", among so many others. According to the psychologist Alexander Marques, in a statement to the blog "Crazy for Shoes" (link 7), the passion for shoes is not considered as something "abnormal" or "pathologic" and is seen like as a foible among others human characteristis. Since antiquity, the shoes are related to power, however the reasons for such (sexual) power that drives a lot of man crazy, is uncertain. Many Women understand that the shoes are an extension of their own personalities. Finally, for women, shoes are a feminine passion; for men rest to accept the crowded closets, to love Hers (and his) fetish and pay for that!